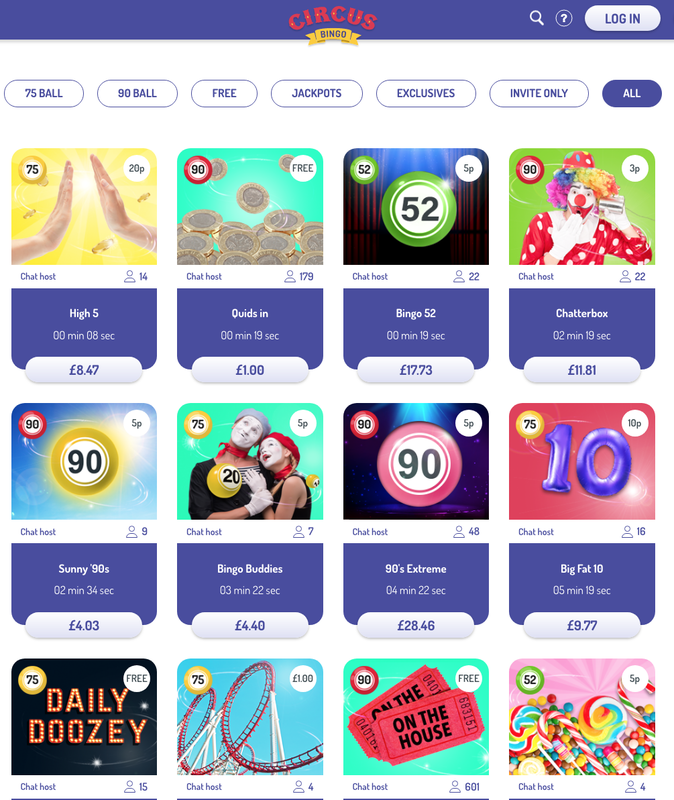 The team behind Circus Bingo claim to have been bored stiff of similar looking bingo sites, recycling the same themes, games and designs. Perhaps you feel the same way- if so, Circus Bingo is the ideal place for you. The site mascot (a mustachioed peanut named Pablo) welcomes players into this one of a kind bingo site, declaring it to be the ´greatest show on earth.´ It´s certainly true that Circus Bingo has broken the often repetitive mould of online bingo, as this bright, colourful and cartoonish circus themed page looks like no other bingo site out there. When it comes to design and layout, Circus Bingo brings something completely different to the table. As well as this, the site also offers exclusive games and unique deals, promotions and bingo bonuses. All of the games on the site are powered by the Dragonfish network; one of the world´s leading bingo networks, so you can rest assured that they are all brilliantly designed and great fun to play. As a member of Circus Bingo, you´ll have access to three exclusive games, which cannot be found anywhere else. The £1k Big Top, Cash Cannon and Everyone´s a Winner. Cash Cannon is an hourly game, which gives away £50 in bonus bingo bucks each day between 11am and 11pm. The incredibly generous Everyone´s a Winner game takes place every Thursday and Friday, and gives away a guaranteed £500 in cash prizes. As well as these truly unique and exciting games, Circus Bingo is also home to firm favourites including several varieties of classic 90 ball bingo, the increasingly popular 75 ball bingo and fast paced 5 line bingo. Many of the games have chat features so you can get to know your fellow roomies as you play. Another great feature of the site is that they provide free bingo games with real cash prizes up for grabs. The site also has slots and scratchcards. There are plenty of ways for players to get in touch with the team at Circus Bingo. If you need help or advice, then it is available at the site 24 hours a day. Friendly and helpful advisors can be reached via email, telephone or through the live chat service. The advisors are usually fast to respond with knowledgeable and handy answers to any queries that site members may have. Circus Bingo is not part of a network. No, you are not required to download this bingo game, there is an instant play version at Circus Bingo . No, Circus Bingo does not offer a downloadable version but you can play instantly on the site.